Waiting for your answers to the problem below. Answer the following trigonometry problem. Report the answer to the nearest tenth. A forest ranger wanted to calculate the height, h, of a large tree. He walked 56 feet from the base of the tree. [See the distance, d, in the diagram.] From that location, he measured the angle of elevation to the top of the tree and it was 12°. 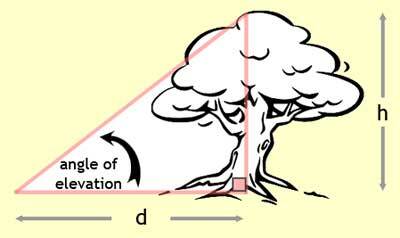 What is the height of the tree?